Reopening in 2018 after an extensive restoration, The Cavalier offers ample high-end meetings and event space on the Virginia Beach Oceanfront. The hotel’s largest event space, The Crystal Ballroom, which had been divided into smaller rooms on different levels, has regained its former magnificence and, with 2,500 square feet of space, can hold up to 200 guests, as it often did as the Roaring 20s rolled through. The 935 square foot pre-function hall and two additional meeting rooms are perfect for pre-event receptions and smaller gatherings. Guests can also escape the traditional boardroom in the porch and garden space overlooking the Atlantic Ocean. All in all, The Cavalier offers 5,000 square feet of beautiful indoor and outdoor space for a retreat guests won’t soon forget. In addition to its meeting space, The Cavalier offers beautifully-designed 62 guest rooms and 23 suites, and ample on-site features including two restaurants, an onsite bourbon and gin distillery, an indoor plunge pool, a luxurious spa, and The Raleigh Room, where guests can grab an afternoon cocktail or tea. Guests can choose from 11 different types of rooms, including the Legacy Suites, each of which were designed in correspondence with the board members who helped make the renovation possible, so no two Legacy Suites are the same. No matter which room you stay in, however, the hotel’s rich history and the modern day are seamlessly blended with rich finishes and clean lines, as well as an uncanny attention to detail in amenities like clawfoot tubs and marble baths. The Hyatt House, at the Virginia Beach Oceanfront, features 156 guest rooms with private balconies with ocean views, a heated, indoor swimming pool, and free daily breakfast, in addition to the attached, stylish H Bar and Ocean 27, an open-air oceanfront bar. Hyatt House also offers 1,943 feet of flexible space for your next business function, including their board room with seating for eight and gathering spaces that can accommodate up to 130 guests in theater-style seating. The hotel offers free Wi-Fi, convenient catering and audio-visual support, as well as a Hotel Host who will be there support you function from start to finish. 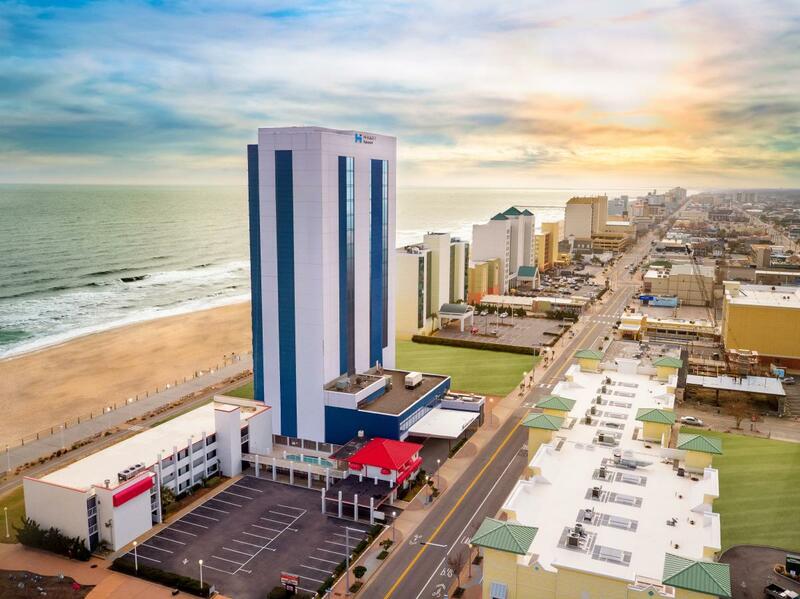 With the Cavalier Hotel completed, the hotel’s developers quickly began working on their next big project at the Virginia Beach Oceanfront, a 20-story, 300-room Marriott Oceanfront Hotel, expected to open in early 2020. The new hotel will have three restaurants on-site, including a beach bar, a sushi bar, and a rooftop restaurant with ocean views. The developers have also announced plans for an Embassy Suites by Hilton, also at the Oceanfront. Together, the three hotels would provide nearly 35,000 feet of banquet, ballroom and meeting space. Whether staying at the Oceanfront’s newly-restored Cavalier Hotel or not, don’t miss out an evening dining at Becca, the hotel’s modern farm to fork restaurant offering decadent American fare crafted from the freshest local ingredients. In fact, many of Becca’s ingredients are grown in their on-site garden, which also features a grand stone fireplace and views of the Atlantic Ocean, making for a spectacular outdoor dining experience. While Becca is an entirely new addition, the name is a nod to the namesake for the hotel’s original signature restaurant, Pocahontas, who changed her name to Rebecca when she converted to Christianity. This is the perfect high-end spot for a work dinner or after-dinner cocktails. Themed like the traditional tiki bars that were all the rage in the 50s and 60s, Auntie’s Tiki Bar & Restaurant is serving up exotic drinks and Filipino and Hawaiian-inspired cuisine. Start off with one of their amazing craft cocktails like the Cool Running, a frozen blended cocktail with vodka, banana rum, orange liqueur, house-made banana syrup, orange juice and lime, garnished with a dolphin-shaped banana, and of course, an umbrella. And for the more daring drinker, the Instagram-worthy flaming Scorpion Bowl cocktail is a must-try. Their menu features authentic foods like lumpia, Spam musubi and dishes made with ube, a purple yam native to the Philippines. Our favorite dish is the popular ube-infused waffles and ice cream drizzled with ube syrup. With its banana leaf wallpaper adorned walls, it is the perfect escape to end your day the island way. Press Wine Bar recently opened on Shore Drive near the Chesapeake Bay District and, as the name entails, it is all about the wine. Everything on their menu from the artisan quality small plates and entrees to their luxurious desserts make for mouthwatering pairings. This place sources organic, local ingredients whenever possible, so it’s hard to go wrong. Start with a charcuterie board or cheese plate to share, and see where the night takes you. Mermaid Winery, on Shore Drive, is the first urban winery in the state of Virginia, with their grapes sourced from premier vineyards in Virginia and California. They also have over 800 wines from around the world that you can taste, too. While the wine might be what brings you in the door, the food here is a must. After your tasting, grab a table outside on their patio, and dig into some local oysters with their seasonal mignonette for a starter. This place comes from the owners of another Virginia Beach mainstay, Eurasia. The Atlantic on Pacific, which is only a little over a mile from its sister restaurant at the Virginia Beach Oceanfront, offers a menu of small plates, mainly focused on the local seafood bounty. The upscale oyster and raw bar is the star of the show here, as well as the list of wines they have to pair expertly with the salty-sweet bivalves. Paired with their extensive collection of bubblies and a menu of cocktails crafted with house shrubs and their own homemade bitters, this place has everything any die-hard foodie could want. From the owners of the popular Virginia Beach bourbon joint, Whiskey Kitchen, comes Civil Libation, off of General Booth Boulevard. With communal seating, an eclectic American menu featuring locally sourced ingredients whenever possible, house-crafted cocktails and 8 craft beers on tap, this place is a locavore’s delight. You can’t go wrong with any of their stylish cocktails but we can’t get enough of the Carpe Noctum, a local take on a White Russian with Three Ships Cold Brew Coffee with vanilla rum and almond milk. It’s the perfect pick-me-up after a long day of meetings.